The health of children in Scotland is at risk because of a shortage of paediatricians, a report has claimed. 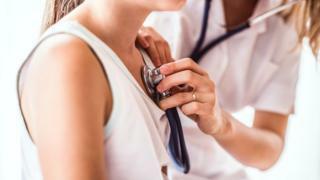 The Royal College of Paediatrics and Child Health (RCPCH) study, published on Tuesday, said the workforce is on the verge of a recruitment "crisis". It found that general paediatricians, who look after children with life threatening illnesses, have experienced the biggest shortfall. The Scottish government said a new plan would be published shortly. Scotland has fallen behind England in the recruitment of paediatric consultants, which increased by 5% between 2015 and 2017 compared 8.2% down south. To deliver the required standards of care to young people, the number of paediatric consultants would need to rise by 25% - which amounts to 82 new consultants. General paediatricians, who care for children from birth to late adolescence, are experiencing the biggest shortage in staff. Doctors trained in this area manage multiple health problems ranging from life-threatening illnesses to chronic diseases. A Scottish government spokesperson said: "The health of our children is paramount, that is why we have more than doubled the number of paediatric consultants under this government to 355, and increased the number of paediatric nurses by more than 40% in the last eight years. "Work is under way to develop a comprehensive plan to help address some of the recruitment and retention challenges faced by our health and care sector. "We have already published workforce plans covering the NHS, Primary Care and Social Care, and an integrated health and social care workforce plan will be published shortly. "Of course the uncertainty around Brexit continues to pose a significant recruitment in the NHS." What affects the demand on consultants? One key issue is the workload for doctors has increased. Between 2015/16 and 2017/18 paediatric emergency admissions in Scotland rose by 9.3%. However the paediatric consultant workforce in Scotland between 2015 and 2017, according to RCPCH census data, only increased by 4.8%. The level of paediatric admissions in some hospitals mean that double rotas are needed more and more. And the number of neonatal consultants on separate consultant rotas in four of the eight units in Scotland is lower than the British Association of Perinatal Medicine (BAPM) standard. It comes after concerns were raised in 2017 over safeguarding, the rising number of children with multiple diseases and long delays in diagnosis for autism and ADHD. The Scottish government will make eight additional posts in 2019 - the RCPCH said it was "grateful" but branded the gesture "a one-off sticking plaster" . The RCPCH report made a number of recommendations including funding for extra GP training which includes child health training. It also called for pay bonuses should be introduced to attract paediatricians, especially in remote or rural areas. Prof Steve Turner, officer for Scotland at the Royal College of Paediatrics and Child Health, said that tackling the shortage of paediatric doctors needs to be a "priority". He continued: "We know that unless more doctors are trained to be paediatricians today, the situation where paediatric wards are being closed will only get worse. "The good news is that we know that Scottish doctors want to train in paediatrics in Scotland. "However, the reality is that we are seeing vacancies and gaps in rotas across Scotland, especially in centres outside of the central belt. "Failing to take the necessary steps now will be to the detriment of our children both today and in the future."